Temperatures drop and rainfall turns to snow. Snowfall can be beautiful and bring a blanket of brightness to the shortened days of winter. However, it also means you will have to watch out for snowmelts. 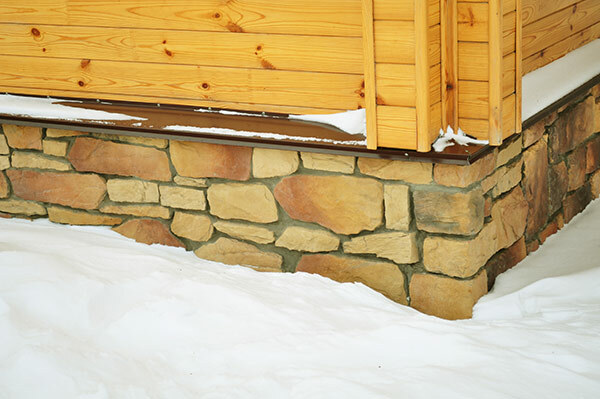 This runoff produced by melting snow can wreak havoc if you aren’t prepared and haven’t taken the steps to winterize your crawlspace or basement. Snowmelt that finds its way into your crawl space or basement can produce constant moisture – a breeding ground for mold, mildew and even cracks or structural damage if left unaddressed for too long. Cracks can lead to water seepage and even bigger problems. Have your basement, crawl space and foundation inspected prior to the onset of the snowy season. If repairs are needed you can get them sooner rather than later! Adding insulation to your basement is a good way to combat moisture as well as create a comfortable environment. Cold and moisture are both bad and, unfortunately, they go together hand in hand. Cold basement walls increase the condensation of moisture in the air and can cause problems. Don’t ignore the crawl space. It may be small, but when you winterize a crawl space with the correct insulation, your crawl space can have a big impact on the overall comfort of your home. Many homes have insulated ceilings in the crawl space, but the walls are bare and exposed. It’s like going out in the cold with a hat on but no coat. Sure, the hat keeps your head warm, but adding a coat keeps the warmth in and cold out of a much larger surface area. The simple act of insulating the walls as well as the ceiling of your crawl space can create a pocket of warmer air below your home. This can reduce the moisture from condensation on cold walls as well as keeping your house warmer all around. The type of insulation is important as well. Standard insulation can actually allow for moisture to sneak in. It can even act as a sponge in some cases. Instead, use insulation that is resistant to water damage such as spray foam or rigid boards. Including a vapor barrier is well worth the investment to combat moisture issues as well. No one likes unwelcome visitors, especially those that can damage your home. Making sure rodents aren’t making themselves at home is another step in winterizing your crawl space or basement. If you can brave the journey through your crawl space, you’ll want to examine it thoroughly for signs of rodents. They are creatures of habit and if they have found a way into your crawl space or basement, you can be sure they’ll be back as the temperatures drop. Keep in mind that the holes they use to get in will let moisture in as well. Ask anyone who has had to unexpectedly relocate to a hotel in the dead of winter – nothing spells disaster like water damage from frozen pipes! Freezing pipes can be a winter nightmare. To winterize crawl spaces and basements you need to include checking pipes. Remember that the closer pipes are to your exterior walls, the more important it is to keep them protected. Pipe warmers and wraps are just a few of the many products that can help keep pipes protected from the cold. Be sure to keep an eye out for condensation around pipes or leaking water to spot potential problem spots and address them right away. Open air vents around the crawl space can also be a source of frozen pipes or water lines. When winterizing your crawl space, you can close or even seal vents when winter hits to help prevent frozen pipes. Originally designed to allow for air flow, crawl space air vents let air in but are not effective at circulating it. They are lower in your home and can contribute to the “stack effect.” This occurs when warm, conditioned air rises throughout the home which results in cold, unconditioned air being pulled in through air vents in the crawl space. This cold, moist air is drawn in and up over pipes and walls where the water condenses and causes excess moisture in your home that can have a major impact on your home’s waterproofing. Crawl spaces with dirt floors can increase humidity in the basement as moisture trapped in the dirt evaporates. Consider installing a vapor barrier as you winterize your crawl space. Vapor barriers block moisture and reduce your risk of mold, insects and even wood rot. Polyethylene plastic sheeting is the most common type of vapor barrier and ranges in thickness from 6-20 mil. Choosing the right thickness will depend on the use of the crawl space and the flooring. A 6 mil barrier meets code and is less expensive, but is thin and more vulnerable to damage. With a dirt floor example, any hard or sharp objects such as roots or stones have the potential to damage your plastic vapor barrier. If an object pokes through, moisture will also be able to come through which will render your vapor barrier much less effective. A crawl space with a concrete floor may have less sharp objects to potentially puncture your vapor barrier. However, if you plan to utilize the area for storage and therefore intend to increase the traffic to the area, the likelihood of compromising the integrity of the barrier goes up. Using a higher 12-20 mil barrier on the floor and opting for lower 6-10 mil on the walls may be a good option for your budget and for an effective vapor barrier.